Create Embellish Adore: Silhouettes birthday! Not your average card, and not your average birthday! I used the Summer Silhouettes stamp set for most of the card.... which is just so much fun! 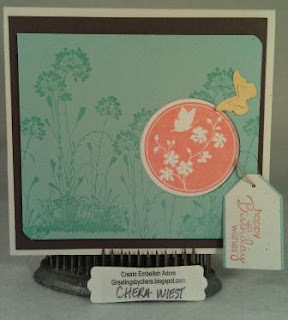 What you cannot see is that the Coral Calypso circle is actually popped up and behind the sky blue/Pool Party cardstock. The card measures 4 1/4 x 4. Alittle odd but it works for me! 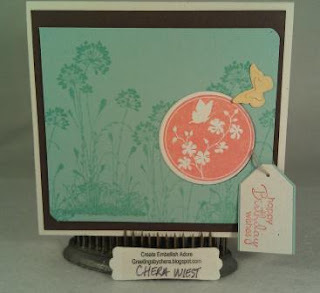 I love the colors of this challenge and your card is perfect. Chera i really like the colours you chose and that circle image. 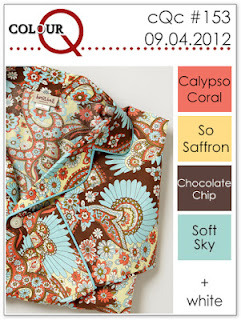 Thank you so much for joining us this week at the colourQ!